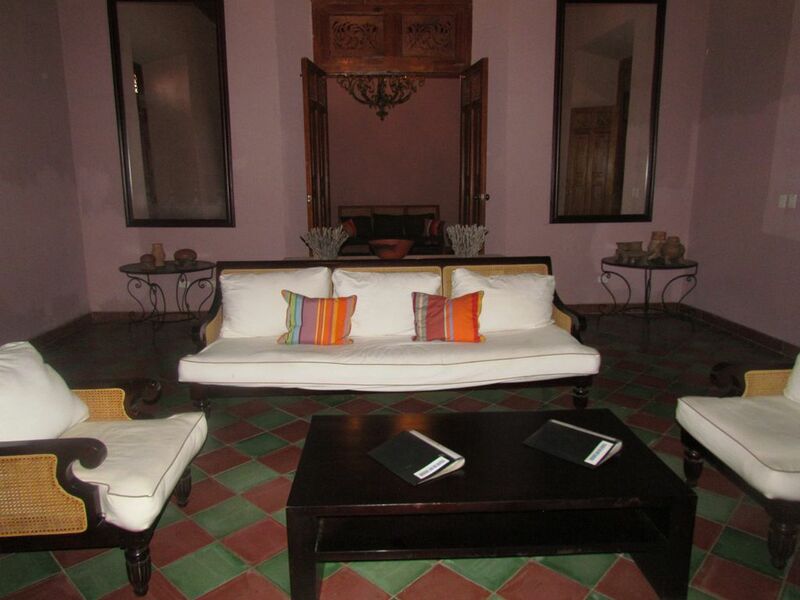 Casa Vega is a beautiful fully restored colonial home just ½ block from the Central Park. This house is what a colonial home aspires to be with its two large living areas, open garden, beautiful wood staircase and large airy bedrooms off the main corridor. The home actually has a “zaguan” which is a hallway from the street that is separate from the living areas so that deliveries and staff could come and go without disturbing the occupants of the house. The two living areas are large with comfortable seating and custom furnishings. There is beautiful art work throughout the house as well as may pieces of hand thrown pottery. The main corridor, the heart of the home, features a beautiful swimming pool in the center with an artistic waterfall and lush gardens. There is ample seating on all sides of the corridor for whatever activity you would like to do such as reading or working on your computer. There is a large dining room table for eight as well as a smaller table for four just off the kitchen. Downstairs, there are two large bedrooms with air conditioning and cable TV .One bedroom features a large king bed with a full bathroom and the other has two twin size beds with access to the bathroom just off the patio. The bedrooms are large and beautifully furnished with access to both the corridor and the back patio garden. The beautiful wooden staircase leads you to a large upper patio which accesses both of the upper bedroom suites. Both have king beds, a large full bath and air conditioning as well as access to the back patio. The views from both patios are amazing, one of the Granada Cathedral and the other of the Mombacho Volcano. Casa Vega is located close to the central park, many fine restaurants and nightlife. It is an easy walk to many of Granada’s art galleries, museums and tourists attractions. No matter if you are with friends or family, Casa Vega is a great place to spend your vacation. The swimming pool is located in the center of the home within the open air garden.